Brown, who is coming to the end of his term as governor, said in a statement that he supports the Feinstein-McCarthy language, including "important provisions ... that enable California water users to participate in voluntary agreements and help improve river flows to restore fish populations." But due to the death of President George H.W. Bush, congressional leaders are expected to punt the spending fight this week and pass a one- or two-week measure maintaining funding levels. The move will give legislators more time to negotiate riders like Feinstein and McCarthy's. 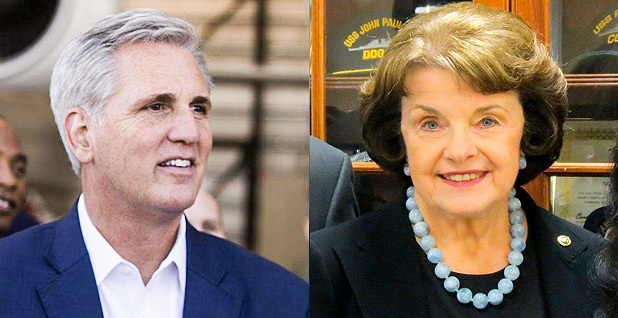 The Feinstein-McCarthy rider comes as the State Water Resources Control Board is considering controversial new water quality standards for San Francisco Bay and the delta, the state's water hub. Those standards haven't been updated in more than 20 years, and the proposal calls for curtailing deliveries to San Francisco and Central Valley farmers to protect stream flows in San Joaquin River tributaries for endangered salmon and other species. "There's no way to sugar coat this," John McManus of the Golden Gate Salmon Association said in a statement. "Today Governor Brown took a big step towards selling out California's biggest salmon runs in order to keep the Trump administration from killing the governor's Delta tunnels." The Brown administration has disputed in media reports that there is any quid pro quo at play in the governor's support for the measure. WIIN Act provisions include $670 million for new water storage projects. That would likely include a controversial plan to raise Shasta Dam in Northern California about 18.5 feet. The more-than-600-foot dam impounds the state's largest reservoir, and agricultural interests have been pushing to expand it for years.